From the political elections of October 16th (2016) in Montenegro the political party of Milo Đukanović emerged as the clear winner. Đukanović is known as the historic leader who divorced himself from Milosevic during the Serbia – Montenegro Union, as the person who was the architect of the Independence Referendum for his country, as the politician who recognized the independence of Kosovo, known to be a political figure who has been consistently in favor of European Union and the NATO. However during the course of this political course and geopolitical orientation, Milo Đukanović and his supporters have made many enemies inside and outside of their country. Inside Montenegro the main adversaries are the Serbs and their supporters who were: against the independence, against the recognition of Kosovo’s independence and against the pro-western orientation of Montenegro. Abroad, the adversaries of Milo Đukanović extend from Belgrade, where there is a stronghold of Pro-Milosevic Lobby, Serbian nationalists, groups and organizations of Cerna Ruka and even the Serbian Church. At the geopolitical levels, lately an Independent Montenegro is faced with a growing direct and indirect pressure from Vladimir Putin’s Russia. The current doctrine of Putin has aggressively returned Moscow’s attention towards Western Balkans. On the Russian focus there are the weak nations of Bosnia and Herzegovina; countries in deep crisis such as Macedonia; states in dilemmas such as Montenegro; young and weak states such as Kosovo. Throughout all of these states Russia is mainly focused at the factor of Serbian ethnic group, on the pro-Russian political factors and at the Serbian Church. The critical current situation in Montenegro is shaped precisely as a result of these political consequences and geopolitical waves in Western Balkans. After the elections of October 16th, 2016 the crisis in Montenegro has deteriorated. The enemies of Independence and of western orientation of Montenegro have made further advancements. They are attempting to physically eliminate Milo Đukanović by using criminal methods and by overthrowing him with a coup d’état. Milo Đukanović openly associated these segments with the clear strategic interests that emerge from Belgrade and Russia. Serbian Prime Minister Aleksandar Vucic admitted the criminal implication of Serbian groups in the recent events of Podgorica. On the other hand the Patriarch of Montenegro’s Church accused the Serbian Church for terrorism. In order to pave the way for investigations, and to soften up this tense situation as well as maintain internal order and government stability in Montenegro, Milo Đukanović decided to resign from his post and Montenegro’s President appointed someone else as his successor from the same party. This action of Milo Đukanović is a temporary attempt to avoid such a deep crisis that is going through Montenegro, but unfortunately it is not a long run solution of this crisis. The Republic of Montenegro is the smallest country equipped with the greatest geostrategic interests. However Montenegro, a small independent republic is unable to face alone such an evil coalition that stretches from Podgorica all the way to Belgrade and Moscow. 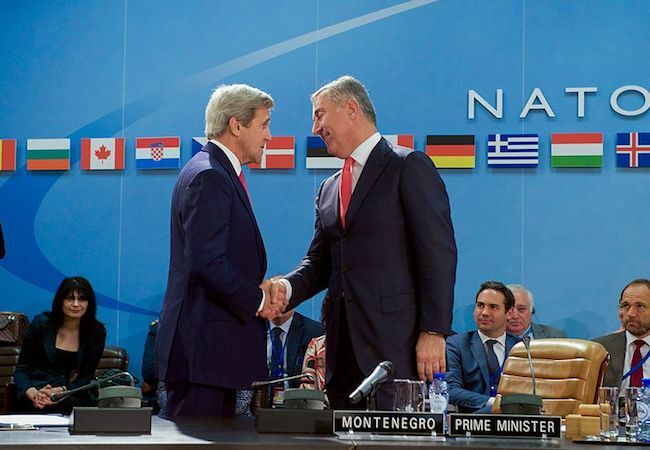 The support for Montenegro must directly come from European Union, NATO and the United States of America. If there is a delayed response today, a vital assistance will be too late by tomorrow.